Besides dainty dishes, visitors of restaurants want to receive a warm welcome and attentive service. And this is what you will be able to express if you adorn your web resource by means of this truly delicious design. Released by the TemplateMonster team not long ago, it allows for setting the warm atmosphere on your site due to a subtle blend of colors and graphics. 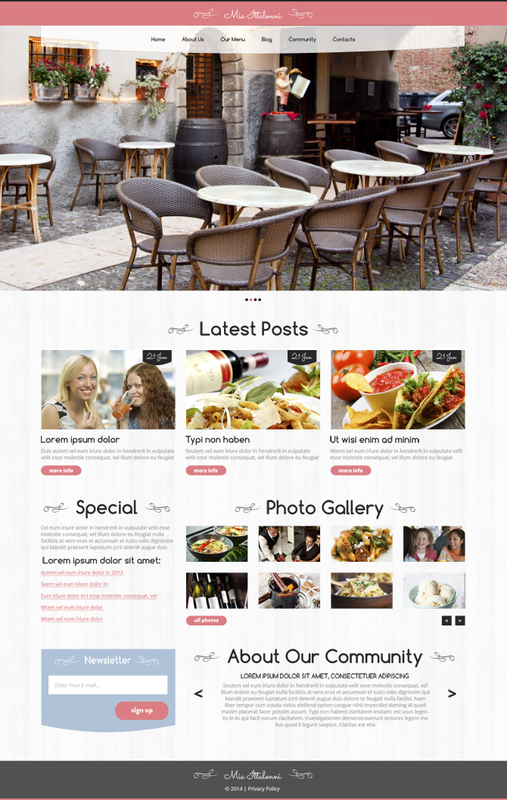 Read on to find out how you can benefit from the Free WordPress Restaurant Theme demonstrated here. This modern design is abundant in various handy features meant to represent your business at its best on the web. They include video & audio embed options, custom widgets for social media integration and comments as well as Accordion, Carousel, and Isotope gallery types. These are only some of the features incorporated into this highly functional template. Powered by the latest version of Cherry Framework, it provides easy installation and intuitive customization, which will let you enjoy using the product. To make the audience interested in your menu, you can show its savory dishes in well-organized blocks complemented with large imagery and descriptions. Using mouth-watering pictures is a wise tactic to whet people’s appetite while the catchy info about your eatery will inspire them to pay a visit eventually. The theme also has a blog section to post some interesting details of your restaurant’s cuisine. Nothing can sound as persuasive as customers’ feedback, that’s why a community block has been embedded into the template’s layout. This WordPress theme is suitable not only for restaurants, but also for any food & drink-related establishments such as cafes, bars, culinary schools, and others. Download this template for free to set an inviting tone on your site.